For other uses, see Perfect game (disambiguation). A perfect game is defined by Major League Baseball as a game in which a pitcher (or combination of pitchers) pitches a victory that lasts a minimum of nine innings and in which no opposing player reaches base. Thus, the pitcher (or pitchers) cannot allow any hits, walks, hit batsmen, or any opposing player to reach base safely for any other reason: in short, "27 up, 27 down". The feat has been achieved 23 times in MLB history – 21 times since the modern era began in 1900, most recently by Félix Hernández of the Seattle Mariners on August 15, 2012. A perfect game is also a no-hitter and a shutout. A fielding error that does not allow a batter to reach base, such as a misplayed foul ball, does not spoil a perfect game. Weather-shortened contests in which a team has no baserunners and games in which a team reaches first base only in extra innings do not qualify as perfect games under the present definition. The first confirmed use of the term "perfect game" was in 1908; the current definition of the term was formalized in 1991. Although it is possible for multiple pitchers to combine for a perfect game (as has happened 11 times at the major league level for a no-hitter), to date, every major league perfect game has been thrown by a single pitcher. In Nippon Professional Baseball, no-hitters or perfect games that use two or more pitchers are considered unofficial. The first known use in print of the term perfect game occurred in 1908. I. E. Sanborn's report for the Chicago Tribune about Addie Joss's performance against the White Sox calls it "an absolutely perfect game, without run, without hit, and without letting an opponent reach first base by hook or crook, on hit, walk, or error, in nine innings." Several sources have claimed (erroneously) that the first recorded usage of the term "perfect game" was by Ernest J. Lanigan in his Baseball Cyclopedia, made in reference to Charlie Robertson's 1922 perfect game. The Chicago Tribune came close to the term in describing Richmond's game in 1880: "Richmond was most effectively supported, every position on the home nine being played to perfection." Similarly, in writing up Ward's perfect game, the New York Clipper described the "perfect play" of Providence's defense. As of 2014, the current Major League Baseball definition of a perfect game is largely a side effect of the decision made by the major leagues' Committee for Statistical Accuracy on September 4, 1991, to redefine a no-hitter as a game in which the pitcher or pitchers on one team throw a complete game of nine innings or more without surrendering a hit. That decision removed a number of games that had long appeared in the record books: those lasting fewer than nine innings, and those in which a team went hitless in regulation but then got a hit in extra innings. The definition of perfect game was made to parallel this new definition of the no-hitter, in effect substituting "baserunner" for "hit". As a result of the 1991 redefinition, for instance, Harvey Haddix receives credit for neither a perfect game nor a no-hitter for his performance on May 26, 1959, when he threw 12 perfect innings against the Milwaukee Braves before allowing a baserunner in the 13th. 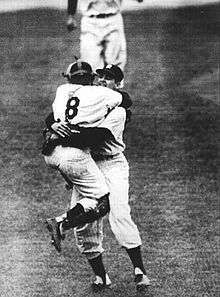 There has been one perfect game in the World Series, thrown by Don Larsen for the New York Yankees against the Brooklyn Dodgers on October 8, 1956. By coincidence, the second Yankee pitcher to throw a perfect game, David Wells in 1998, graduated from the same high school as Larsen - Point Loma High School in San Diego, California. In a further coincidence, Larsen was in attendance when the third Yankee pitcher to throw a perfect game, David Cone in 1999, performed the feat on the same day that Larsen and Yogi Berra (the catcher in the 1956 perfect game) were invited to do the ceremonial first pitch. The most recent perfect game pitched in Major League Baseball was thrown by Félix Hernández of the Seattle Mariners against the Tampa Bay Rays on August 15, 2012. He struck out the side twice and struck out twelve total batters in the 1-0 victory over Tampa Bay. Since the beginning of the 2009 MLB season, it was the third time that the Tampa Bay Rays were on the losing end of a perfect game. The only perfect game thrown in a Little League World Series championship was by Angel Macias of the Monterrey, Mexico, team in 1957. ↑ Madden, Bill (September 12, 2008). "Yogi Berra's Favorite Stadium Moment: Don Larsen's Perfect Game". Daily News. Retrieved February 5, 2010. ↑ "MLB Miscellany: Rules, Regulations and Statistics". Major League Baseball. Retrieved August 20, 2007. ↑ "History: No-hitters". Major League Baseball. Retrieved August 22, 2007. ↑ Deutsch et al. (1975), p. 68. This source also includes an 1880 clipping from the New York Herald describing Lee Richmond's perfect game for Worcester. A double error by Cleveland resulted in the lone run scoring, and the writer described it as "the only lapse from perfect play made by the Clevelands during the game"; the use of the word "perfect" in this context refers only to defensive play, a different meaning than its modern baseball sense, as Cleveland's pitcher also surrendered three hits and a walk. See Deutsch et al. (1975), p. 14. Writeups for the Ward perfect game of 1880 and the Young game of 1904 describe the games as "wonderful" and other effusive terms, but do not use the term "perfect game". ↑ Buckley (2002), p. 16, citing Paul Dickson, The Dickson Baseball Dictionary (1989); Coffey (2004), p. 50. The Baseball Cyclopedia reference came in a supplement to the 1922 edition of the book (a publication of Baseball Magazine) and was worded thus: "Charles Robertson of Chicago Americans pitched an absolutely perfect no-hit game against Detroit on April 30, 1922, no one reaching first." The publication listed all the perfect games to that point (a total of five, including Robertson's) and used the term "perfect game" matter-of-factly, possibly indicating the term was already familiar to the readership. Lanigan's work references a 1914 book called Balldom as a source for his list of perfect games, although Balldom itself does not use the term "perfect game", merely characterizing the games as "no batter reached first base." Lanigan was also familiar with Sanborn's baseball articles, making various references to him elsewhere in the Cyclopedia, although there is nothing indicating that Sanborn necessarily inspired Lanigan's use of the term. ↑ Buckley (2002), p. 15. ↑ Buckley (2002), p. 26. ↑ Young (1997), p. 29. ↑ Forker, Obojski, and Stewart (2004), p. 116. ↑ "David Wells Field in Point Loma gets renovated". ABC 10 News. July 1, 2014. Retrieved 21 July 2014. ↑ "David Cone Perfect Game Box Score by Baseball Almanac". Baseball-almanac.com. 1999-07-18. Retrieved 2016-11-18. ↑ Morrison, Jim (April 5, 2010). "The Little League World Series' Only Perfect Game". Smithsonian.com. Retrieved September 28, 2015. Chen, Albert (2009). "The Greatest Game Ever Pitched", Sports Illustrated (June 1; available online). Hanlon, John (1968). "First Perfect Game In the Major Leagues", Sports Illustrated (August 26; available online). Holtzman, Jerome (2003). "Pitching Perfection Is in the Eye of the Beholder", Baseball Digest (June; available online). Lewis, Allen (2002). "Tainted No-hitters", Baseball Digest (February; available online). Newman, Bruce (1981). "Perfect in Every Way", Sports Illustrated (May 25; available online). Vass, George (1998). "Here Are the 13 Most Fascinating No-Hitters", Baseball Digest (June). Vass, George (2002). "Seven Most Improbable No-Hitters", Baseball Digest (August; available online). Vass, George (2007). "One Out Away from Fame: The Final Out of Hitless Games Has Often Proved to Be a Pitcher's Toughest Conquest", Baseball Digest (June; available online).